This past weekend I had the opportunity attend the Sisters in Power event by the Push Thru organization. 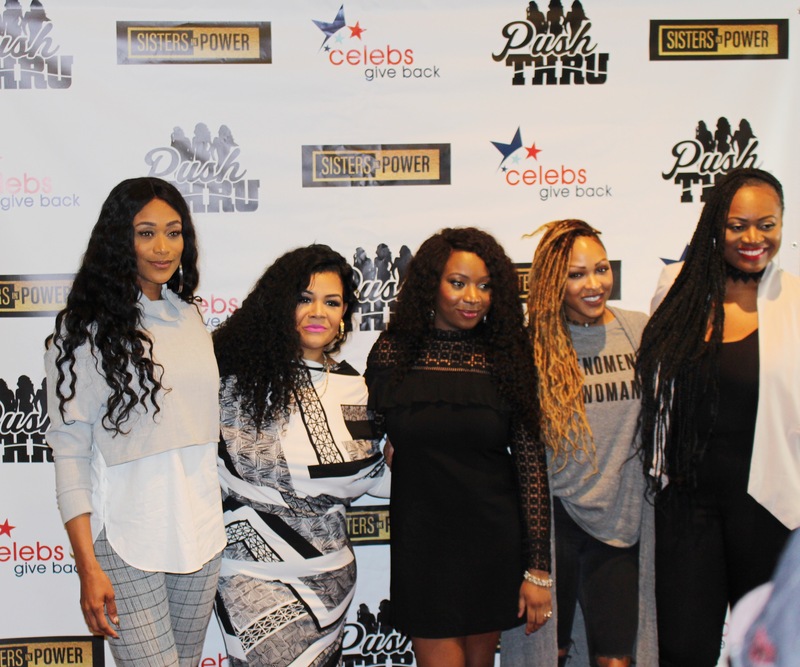 It included celebrity guests Meagan Good, Tami Roman, Wendi J. Turner, Juliana Richards, and Kecia J. hosted by local radio personality Viva La Koi. Royce Reed was also in attendance performing with her dance company Fantashique. I arrived at the Sisters in Power event not really knowing what to expect but I was pleasantly surprised. There were really good topics of discussion and the panelist had really amazing things to say regarding life and business. Most of the ladies I was just being introduced to, but of course, Meagan was Meagan in all of her glory (love herrrr), and I was most surprised by Tami Roman. “When I divorced Kenny I was very depressed for about 6 years, I didn’t date, I felt like there was something wrong with me, why couldn’t I make my marriage work, this thing didn’t last, I gotta fix myself I went thru all of that…” This was so very relatable for me because I’ve gone through a similar situation. That statement brought her to a more human level rather than just a TV personality. I am glad that I had the chance to meet her. Takeaway 1: When things don’t work out for you, be careful with placing the burden of blame on yourself! Juliana Richards gave some solid advice on going hard and hustling for your dream. She is a multi-millionaire with several businesses in the apparel industry. She came to the country from Africa with plans of the American dream. She says that whenever she approached roadblocks she always wondered if it was her, but she eventually realized it didn’t matter and nobody cares, you have to go hard for your dreams. She embodies the Sisters in Power movement. Takeaway 2: When life and business get overwhelming, sleep on it then wake up with renewed perspective then try again. What is the one thing that gives you power? “The one thing that gives me power is THE one thing, and it’s Ephesians 3:20 power. And so I’m not confused or bamboozled on what that looks like, and I know what it is to overcome, I know what it is to walk alone, I know what it is to be different, and be isolated because I’m different, as all of us have in some way. This was my first time hearing of her and let me tell you I was ready to jump out of my seat and shout like I was in church! She literally gave me life the entire night. She was truly the essence of Sisters in Power. Takeaway 3: Don’t be afraid to stand tall and boldly in who you are. Harness your God given power and be everything you are called to be. Next, Kecia J spoke about her shocking AIDS diagnosis at a very young age. She is a speaker and HIV/AIDS educator helping women to see their worth and realize that life is to be lived and not be taken for granted, with mediocre attempts at self-care. She spoke very candidly about her humbling experience in a jail cell where she had to face herself. Face the facts that she was asking God for his best yet she was positioning herself with the opposite. How can we motivate our young girls to greatness? “…In that moment, by that toilet with feces in it, I had to look in that toilet and see everything that I truly didn’t like about myself. I literally had to turn around and say: I’m really in some sh*t right now. Who am I surrounding myself with? Who am I on the phone with? Who am I giving my vision to? Who am I letting lay hands on me? Who am I letting penetrate me? …And so in that prison cell, facing life in prison for something I didn’t do, it took for God to say: Now do I have your attention? The 2 T cells didn’t do it? So my point is, you can’t mentor until you look at the things you don’t like about yourself! I cannot go and tell women, you are greater past your diagnosis if I don’t feel like I’m greater past my AIDS diagnosis. God said to me: How are you wanting me to take you to greatness and your hanging around the non-great? I had to notice that about myself before I mentored. So that is where we’re going wrong. We wanna mentor but we haven’t even been mentored yet. This is what it truly means to be Sisters in Power. Serious words of wisdom. Takeaway 4: Own your truth, walk boldly in it and know that God has plans for your life that are greater than the plans that you have for yourself. This was a continuous theme throughout the night. Meagan Good spoke a lot about being who you are and not letting the opinion of others shape you or negatively affect you. Ultimately this event was a great night out for a mommy like myself. It was very inspiring, good people, great music and an all around good experience. If you are are looking for a nice evening out, check out this conference. They may be coming to a city near you.